This week we speak to 18 year old Benedict Ang. 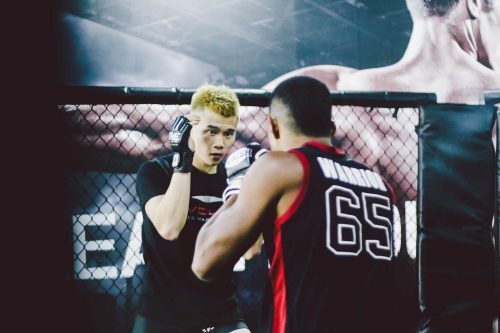 He is an Assistant Instructor at Evolve Mixed Martial Arts in Singapore. Benedict is currently Republic Polytechnic pursuing a diploma in Sports Coaching. 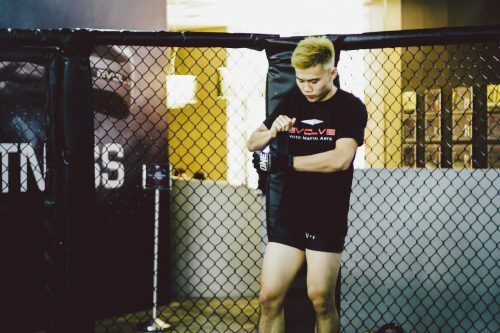 Benedict first started training in the art of Muay Thai at Evolve MMA in 2011. He joined the Evolve Competition Team, the amateur fight team of Evolve MMA, in 2013 and has since joined the Evolve Fight Team. Benedict holds a Blue Belt in Brazilian Jiu-Jitsu under Master Renzo Gracie and made his amateur MMA debut in June 2013. WHEN AND WHY DID YOU START TRAINING TO BE A FIGHTER? 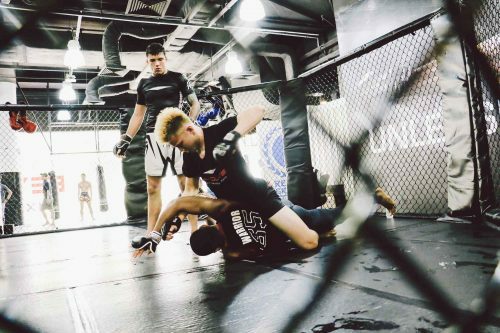 My training started at 16 years old, after being inspired by Eddie Ng, my first MMA coach. I feel MMA is the most honest sport – you can’t lie when the cage door shuts. It’s the ultimate test for any human being. Going up against someone who’s trying to impose his will on you. I can’t help but enjoy the process of methodically breaking down my opponent. HOW DOES IT FEEL WHEN YOU ARE IN THE RING? I feel free, letting myself enjoy the hours of hard work I’ve put in. I like the feeling of also being in the moment. WHAT IS YOUR TRAINING REGIMEN LIKE? I train twice a day, focussing on learning and sharpening my craft. I also spend two or three sessions every week on conditioning work, depending on what aspect I would like to work on. WHAT IS YOUR FAVOURITE TECHNIQUE? I don’t have one. But if I had to choose, it would be the Kamehameha (I’m a big ‘Dragon Ball’ fan)! DO YOU HAVE A STRICT DIET YOU STICK TO AND WHAT DOES IT CONSIST OF? When I’m not fighting, I don’t follow a strict diet. I just make sure I have all the nutrients needed. Most meals consist of meat, vegetables and rice. My diet becomes more selective when I’m preparing for a fight. I stick to good carbohydrates, like sweet potatoes and brown rice. But I do indulge in a cheat meal on Saturdays. WHAT DO YOU RECOMMEND TO YOUNG ATHLETES ON HOW TO MAKE IT TO THE NEXT LEVELS IN MMA? Find a coach who cares about you and knows what he’s doing. Put in the hard work. Trust the process and believe that your efforts will pay off. WHAT SUPPLEMENTS DO YOU TAKE AT THE MOMENT, AND WHAT WOULD YOU RECOMMEND TO OTHER ATHLETES? I don’t take supplements. Instead, I recommend eating right and getting the right nutrients. WHAT PLANS DO YOU HAVE? I plan to keep training and fighting, and hopefully I can make a good living out of MMA. Pay it forward and enjoy life!